SUVA, Dec. 19 (Xinhua) -- Farmers from the South Pacific island nation of Samoa have benefited from the China-proposed Belt and Road Initiative (BRI), which was raised by China in 2013 and has been praised by both government leaders and farmers of the island nation. In a recent exclusive interview with Xinhua, Samoa's Parliament Speaker Leaupepe Taimaaiono Toleafoa Faafisi spoke highly of the Belt and Road Initiative and thanked China for its support to the island nation's economic growth. "The Belt and Road Initiative is very good and we thank China for raising this initiative, which is to promote the global trade cooperation and especially good for the South Pacific island countries like Samoa," the parliament speaker said. "Samoa wants to expand cooperation with China under the framework of the Belt and Road Initiative, and we need China's support to grow our economy," he said. As for China-Samoa Agricultural Technical Aid Project (CSATAP), which is a bilateral cooperation project between the two governments since 2010, Faafisi said: "Besides tourism, agriculture is the backbone of our country. As a country leader, a farmer and also a businessman, I am very grateful to China's support to us such as the agriculture cooperation project led by Mr. Liu Zhiwen." "They have helped promote our agriculture and Samoan people have really benefited from this project. The Chinese team is doing the right thing. If we want to be healthy and wealthy, we must follow up as they are helping us in a good way of developing our land,"
According to Liu Zhiwen, leader of the Chinese experts team, the Belt and Road Initiative has really helped the Samoan farmers and the agriculture cooperation project is "a great success". "We are very happy to serve Samoan farmers with our expertise as well as engaging in technical exchanges and training with our local counterparts. Phase four of the China-Samoa Agricultural Technical Aid Project has been in smooth progress. 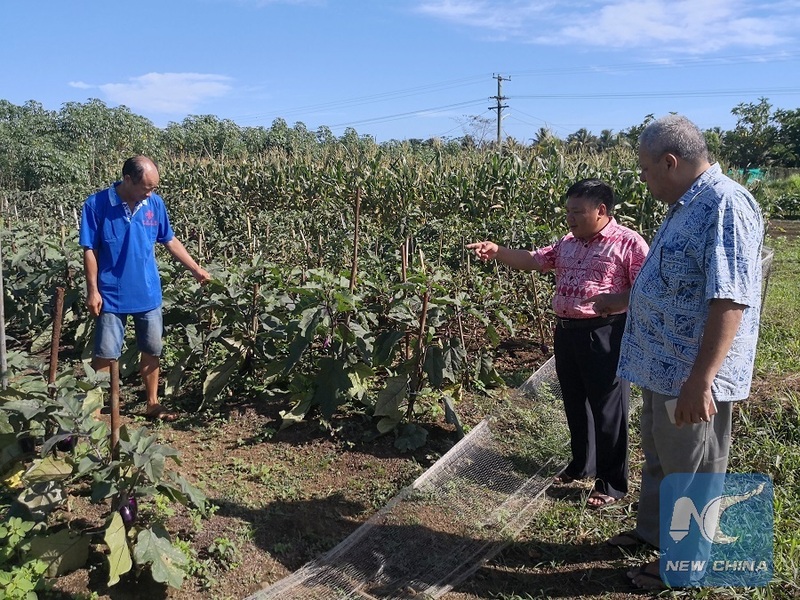 Many officials, experts, investors, farmers and students from Samoa have visited the project, and mass media has also reported the project positively," Liu told Xinhua in the Chinese demonstration farm in Apia, capital of Samoa. The Chinese government has provided a total budget of six million U.S. dollars for the four phases of the project, and the phase four project was launched in June 2017 with nine Chinese agricultural experts being assigned to work in the island nation for three years. The phase four project aims to increase vegetable production, partly substitute vegetable import, stabilize the food security and increase local farmers'income in Samoa by enlarging vegetable cultivation, introducing marketable vegetable varieties, and extending adoptable agricultural technologies, agro-machineries and facilities, Liu said. Besides upgrading the capacity of the Chinese demonstration farm in Apia, Liu's team also aims to establish 100 model farms on both Upolu and Savaii,the two main islands of Samoa by constructing 110 tunnel houses and shadow houses and providing agro-machineries. Tilafono David Hunt, chief executive officer of Samoa's Ministry of Agriculture and Fisheries, voiced his satisfaction over the agriculture cooperation project, saying: "This is a very important project not only for our ministry, but also for our nation's agriculture sector." "The Chinese experts team is well impressed and they have new ideas in spreading new production technologies such as the tunnel house and the shadow house. They are helping us produce more vegetables and helping our farmers to make extra money. I believe the Chinese team will make contribution to our agriculture's development by providing us needed knowledges, technologies and equipments. We hope that we can export our vegetables to other Pacific island countries in the future," Hunt told Xinhua. For John Maposua, a pilot demonstration farmer from the Aleasa village in Apia, he has installed two tunnel houses and drip irrigation system in his farm. 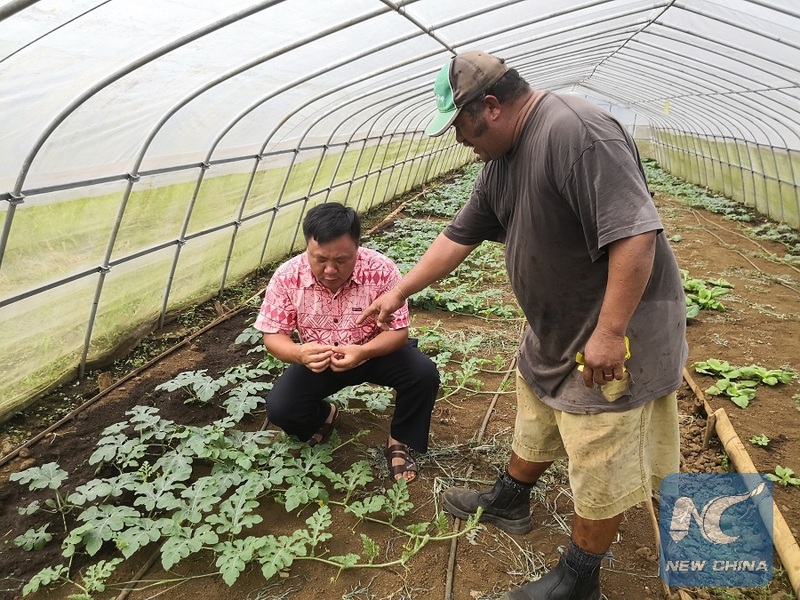 Maposua told Xinhua that the project is really good as more and more demonstration farmers like him are benefiting from the project which has trained more than 7,000 Samoan farmers. "China is our real friend and I want to thank China for its Belt and Road Initiative because my income from the two tunnel houses has reached 11,000 Samoan tala (about 4,300 U.S. dollars) during the first six months," he said with a smile on his face. Commenting on the Chinese assistance to the Pacific island nations including Samoa, Samoan media said recently that there is no doubt the Chinese have done their homework on the needs of Pacific island families. As the Chinese Ambassador to Samoa, Wang Xuefeng told Xinhua that China has a famous proverb as saying "Give a man a fish and you feed him for a day; teach a man to fish and you feed him for a lifetime." Wang hailed the agriculture cooperation project as really "a down-to-earth project", which has a great potential and will no doubt benefit Samoans. "China and Samoa have inked the memorandum of understanding (MoU) of cooperation for the Belt and Road Initiative. China will continue supporting Samoa's efforts to develop its economy and improve people's livelihoods, and China stands ready to expand practical cooperation with Samoa under the framework of the Belt and Road Initiative," the ambassador said.